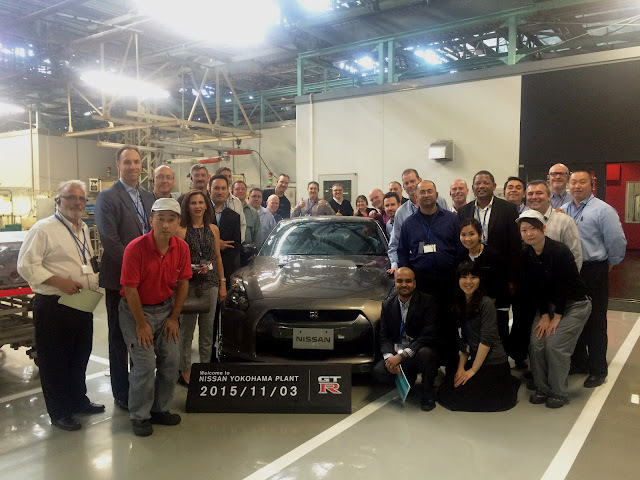 On Tuesday, our visit to the Nissan Yokohama Engine Factory gave us once-in-a-lifetime opportunity to meet and chat with the number 1 "Takumi", Takumki Kurosawa (by coincidence his name is also Takumi). Takumi is translated as "master artisan". One of only 5 Takumis in existence that build the GT-R engine by hand, Mr. Kurosawa was extremely humble and gracious as he visited with us. As a bonus, Mr. Kurosawa had one of the 3 apprentices come out and meet us as well. She is the first female to ever make it this far, and it will take many more years before she can achieve the title of "Takumi". Later in the afternoon, after another excellent Japanese lunch, we visited the Toyota Commemorative Museum of Industry and Technology. We were able to learn about the history of Toyota and get a glimpse into Toyota's future plans. All-in-all, a fantastic day and incredible close-up look at how the best of the best perform.